Wood warblers feed mainly on insects, which they seek busily everywhere, much like the Old World leaf warblers. While searching for food, they move on the ground amid grass, on bushes, or in the foliage—in some cases also on tree bark. Several species are able to live and feed together in overlapping habitats because of the availability of their primary food source, as well as the slightly different feeding habits many exhibit. Although small arthropods are the main food of wood warblers, some species occasionally take berries, seeds, or even the juice inside fruits. Regardless of their fare, wood warblers have bills suited to the job at hand. Their typically thin and pointy bills allow them to extricate insects and spiders from tiny splits in bark or spaces between grass blades. The sharper bill of many other warblers expands their feeding range into seeds and berries. Species like the myrtle warbler/yellow-rumped warbler can only survive the winter in eastern North America by feeding on berries and sometimes seeds. Others, like the blue-winged warbler, have longer bills that provide access to insects buried within flowers. The American redstart is unusual in its bill structure and its feeding habits. Its relatively short and broad bill combine with its quick reflexes and excellent flying ability to give it the tools required for in-flight insect capture, much like the flycatchers (family Tyrannidae). 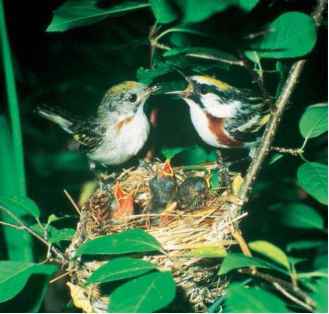 While wood warblers retain their general feeding habits all year, they typically are territorial among their own species only when they are on summer breeding grounds. During the migratory flights and at their winter residences, most warblers are communal, if not necessarily gregarious. In some species, the males and females separate and tend toward different habitats in the winter, so an observer might spot a group of males in the woods and a small flock of females in a field.